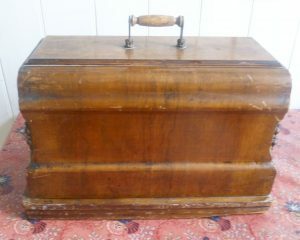 This, believe it or not, is my sewing machine, it dates from between 1898-1904. I’m not sure of the exact date because I’ve never come across another one like it. I bought it for £5 when I was a student and I’ve used it ever since. What immediately attracted me to it was the decoration – and the price. I was a student living on a grant, after all. This is the cupid from the base plate. 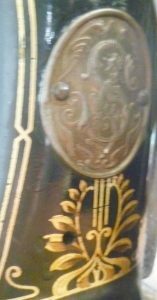 There’s another cupid on the right but the decoration down left side is simple with, perhaps, a nod at Greek decoration with a touch of Art Nouveau thrown in. Hiding behind the spool winder there is an oval plate embossed with the letter S. Could that mean that it’s a Singer sewing machine? I don’t know. The needle clamp on the left isn’t that different from modern machines, but the spool (or bobbin) certainly is. Unlike modern spools, it is long, not round, as the photo above shows. Before you can sew anything, you need a spool-full of cotton. This is where the spool winder gadget comes in. 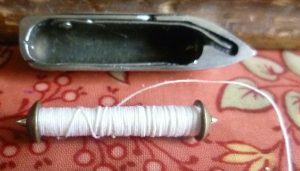 You put a cotton reel on the right hand spike (see pale yellow cotton reel) and wind a short length of cotton round the spool and then put that into the spool-shaped space on the gadget. You can just see the pale yellow of the spool in the photo, and the cotton coming down from the cotton reel. There is a small rubber wheel which connects the spool winder with the balance wheel which has the handle. As you turn it, miraculously, the spool fills up with cotton, moving neatly from side to side so that it’s even. When it’s full, it clicks and stops. 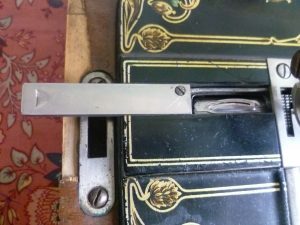 You can then cut the thread, remove the spool from the winder, and slot it neatly into the shuttle holder beside the needle. You turn the handle and and the needle comes down and – don’t ask me how – makes a loop round the spool cotton. You have a potential stitch. You ease the spool thread out so that you have two strands of cotton showing, one from the needle and one from the spool. I’ve opened the sliding drawer so that you can see where the spare spools etc. live. The pale yellow cotton reel on the right is the reel for the spool. You don’t need it until until the spool runs out of cotton and you need to wind some more. The cotton reel on the left is the one which turns while you’re sewing. However, the sewing machine’s wonders don’t stop there! 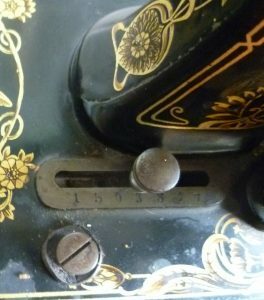 The photo above shows the tension regulator knob, situated under the spool winder. You can slide it up and down to create larger or smaller stitches. The large screw you can see at the bottom left allows you to open the base and see the workings of the machine underneath. I was thrilled when I discovered this. Not only is the engineering a joy to behind, it’s also brilliantly simple. The machine rarely goes wrong but, on the odd occasion when it does, if the cotton snarls up, for example, you can see at once what’s wrong and disentangle it. All it’s ever needed is a little oil from time to time – and there are small holes in various places to pour a drop or two in. Of course, it didn’t come with any sort of manual but the man I bought it from showed me how to use it. 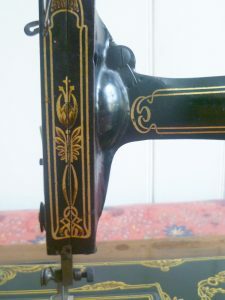 I made my own clothes when I was a student (including a white silk evening gown for a Hunt Ball – but that’s another story) and dresses for my daughter when she was little; and most of the curtains in the house were made using this sewing machine. It’s slow but it’s reliable and at least you don’t inadvertently press a pedal and find a seam shooting across the middle, as happened when I tried out a friend’s electric sewing machine. It’s been a bit battered by time but I don’t care. The only thing I have against it is its weight. You could prop open a barn door with it. Ooooh! What a gorgeous machine. So ornate, it is a marriage of art and craft. Not a Singer, I think. Singer’s logo “S” has distinct serifs, and their legacy products had prominent full-name branding, as far as I can see. Yes, you’ve got something unusual and special here! 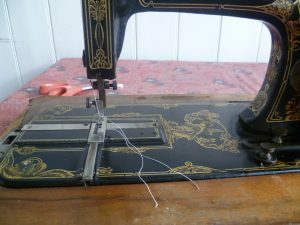 You might try sewalot.com and its vintage sewing machine enthusiast-owner Alex Askaroff. He seems to be the right kind of cove to identify your machine in a trice. His homepage is a bit busy, but you’ll find his email listed. Keeps a repair shop, Sussex Sewing Machines, in East Sussex. Kudos, Elizabeth, for keeping this work of art a useful and relevant tool. Thank you for your comment, Steve. I’m delighted you enjoyed the post. I don’t know about ‘kudos’, though! 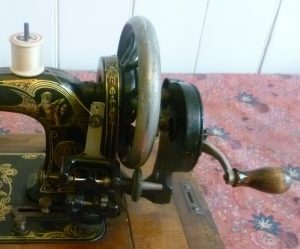 I keep it because I’m terrified of modern sewing machines; they are too fast and too complicated. 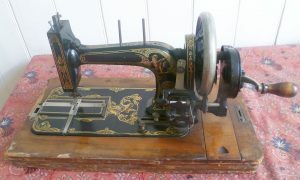 It’s the modern sewing machine owners who deserve respect, in my opinion. How beautiful, Elizabeth. I do love the simplicity of a useful working machine. I agree, Jan. 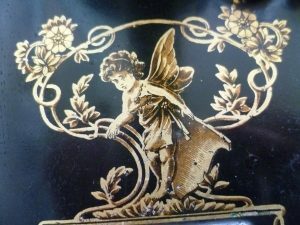 I still use my great-grandmother’s black lacquer and mother-of-pearl sewing box. Mind you, she used it to hold her embroidery silks and I use it for boring things like elastic and button cotton. It’s really too small for what I need but I like using it. What a gorgeous object! Lovely. 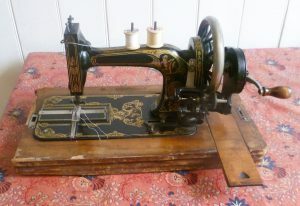 I remember my mother’s very early Singer, which was treadle operated, so not as early as yours. 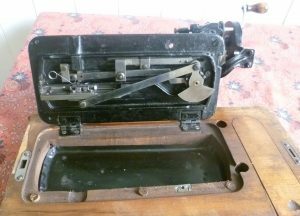 I bought an aged machine for £15 in my youth – an early electric – but it blew up! I went back and swapped it for a £30 one which I’ve had forever. Not used it for about 30 years though! I only sewed for a brief few years (also as a student) and abandoned it when clothes became so cheap it wasn’t worth the effort for me. But LOVE this little machine of yours and also the fact you are still using it. Charm all its own, which you now share. Thank you for your lovely comment, Elizabeth. Actually, I don’t use mine that much nowadays, either. I’ve still got some curtain material waiting for me to get round to making new curtains for my bathroom. With a bit of luck, this will give me the push I need to actually do it! Good to hear from you, Anne. I think that, nowadays, sewing on buttons and sewing up a hem is probably really all you need. The last time I darned a hole in a favourite jumper, a total stranger stopped to admire it – the darn, not the jumper!